Banish 1 card from your Deck, face-up. During your second Standby Phase after this card’s activation, add that card to your hand. I am old enough to remember the hype that Gold Sarcophagus had. A player I knew personally participated in Yu-Gi-Oh Day, got Des Volstgalph for finishing high in the tournament, and wished he’d finished lower so he would’ve gotten Gold Sarc as it is abbreviated. Simple to use, banish something from your deck, get it during your 2nd Standby Phase. This made Different Dimension Capsule useless as it didn’t need to stay on the field like DDC had to. While this was always used to search stuff and set up plays, it was such an amazing card even back with the limited card pool, as well as the negative of showing your opponent what you were planning. If you searched a BLS or CED, you were starting the timer to destruction for your opponent. Nowadays though Gold Sarc has become an even better card. There are many monsters that activate on being banished in any fashion, and the Thunder Dragons take this to a whole new level. This card provides you with advantage and can be the card that starts a big turn. Pretty good for an 11 year old card that when it first came out was a -1 for two turns before breaking even. 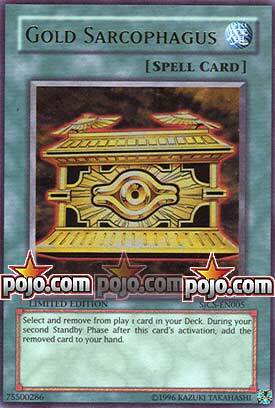 It is Unlimited for now in the TCG, and Thunder Dragon players should be packing three of this in their deck. That won’t last though, it will get hit eventually. Gold Sarcophagus is an excellent ThrowBackThursday choice for Thunder Dragon Week 2. It’s a Normal Spell Card with no real cost. You banish any 1 card from your deck, face-up and get it back during your second Standby Phase after activation. There is nothing preventing you from activating more than one of Gold Sarc, particularly in Thunder Dragons which will gain effects upon being banished. So this card gives instant advantage to current and future decks and then further turn advantage later on. It’s also versatile enough to be included in other decks, particularly stun decks since those duels last long in general. Run three until the ban list hits like in the OCG. I didn’t want to look at Twin-Headed Thunder Dragon for this week’s Throwback Thursday because reviewing an old Fusion with no effect and having very specific Fusion Materials is easy to call bad, give a low rating, and move on, especially since it isn’t Level 5 or lower for Instant Fusion, and reviewing Kaminari Attack is too easy since it is only good for being a Thunder Fusion that is an Instant Fusion target so I went with a card that synergizes with Thunder Dragons and many other archetypes, Gold Sarcophagus. Gold Sarc is a Normal Spell that lets you banish a card in your deck and add it to your hand after 2 of your Standby Phases pass. Back in the day, the game was slow enough to where this was a good option to search for anything, but now waiting 2 turns for a card you really need isn’t optimal and it is better to take the chance in hard drawing it, but this card is still good for something else. The Thunder Dragons we looked at the last two weeks do have effects when banished, so this will trigger them all, but Thunder Dragons aren’t the only options for this. Metaphys is another great archetype that has effects when monsters are banished. If you are still playing them, D.D. Scout Plane and D.D. Survivor can both be summoned at the end of your turn if banished off this. Necroface will banish the top 5 cards of each player’s decks when it is banished off this, and that is great in combination with cards like Soul Absorption, Golden Homunculus (which I don’t know if you’ll play), and Gren Maju Da Ezia. A very niche use is to banish something to put into the GY during your opponent’s Standby Phase with PSY-Framelord Omega, but Omega is now limited and you are probably banishing cards already without this when you summon Omega unless you only use that to take cards out of the hand. The most optimal use for this is in the Thunder Dragon and Metaphys decks though and the others are good for fun decks. You’ll likely never be using this in intention to get a card in two turns, but it might pop up in rare circumstances. Gold Sarc helps abuse banishing effects and was limited before when used to search cards two turns later, so I can imagine it will get limited again like it did in the OCG since it is helping abuse banishing effects. Art: 3/5 What’s in the box, Patrick? I missed the last one there but I believe I’ve been in on the other 3. What’s much to say about this. It improved on Different Dimension Capsule, potentially grants you access to any card in your Deck, which is beyond excellent, and insane. I feel given how quickly the game has evolved to be, that two turns waiting for a card (albeit, again, ANY card from the Deck) is just too long a time. Losing it, as it’s removed, is a terrible loss. But just the same, there are countless ways to retrieve removed cards these days too, so it shouldn’t be the end of the world. If you’re adventures enough to use this, the payoff is obvious, and I wouldn’t fault you at all.